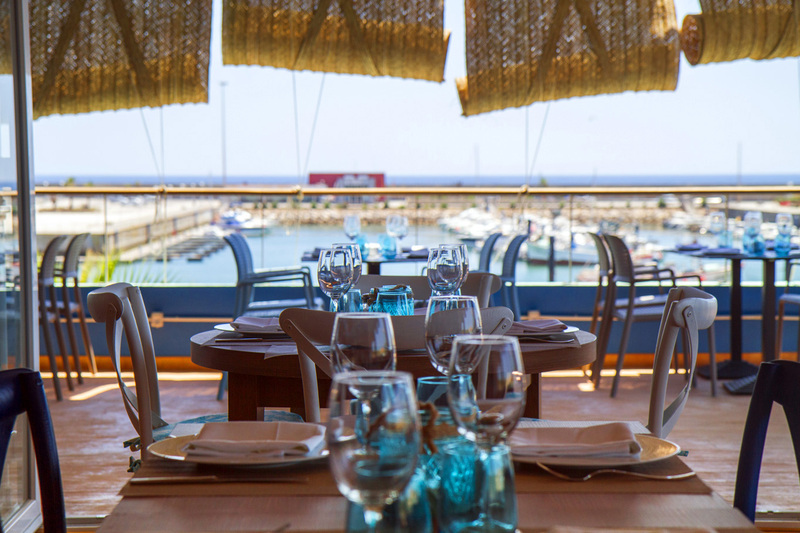 At the El Capitán restaurant on Barbate marina, an extensive LD Systems® installation is providing excellent sound with a stylish look. In addition, Cameo® light technology is helping to create the party atmosphere. 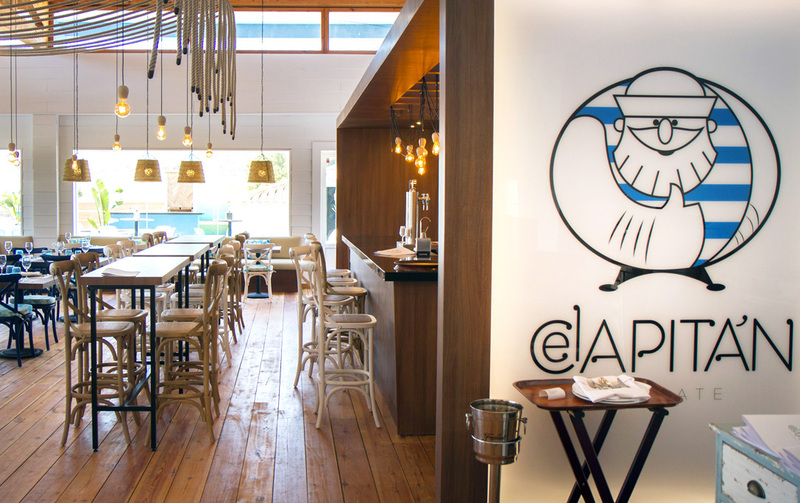 A maritime atmosphere with Andalusian flair combined with creative cuisine in a traditional environment – these are the ingredients on offer to guests at El Capitán. And they love to come here to enjoy the views of the harbour basin, the delicious food, the cosy ambience, and to party or chill out in the lounge area. The small town of Barbate is located on the Costa de la Luz in Spain, about 70 kilometres south of Cadiz. Warm tones and white walls dominate the interior of El Capitán. Several white CURV 500® AVS systems are harmoniously integrated into the surroundings. Additional AVS systems provide sound for one of two spacious terraces. Colour-matched CURV 500® WMB W white wall brackets provide professional mounting for the many satellites. The patented and multi-design-award-winning CURV 500® AV sets each deliver 380 watts RMS with their 10-inch subwoofers. 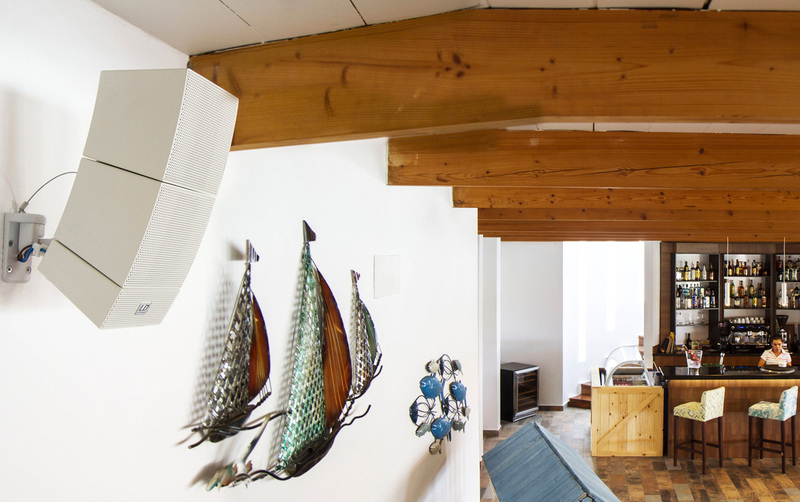 Thanks to the LD Systems-developed WaveAhead® technology, whereby the tweeters are positioned vertically above the high-performance full-range speakers, the array satellites distribute the sound evenly throughout the premises. Even quiet background music comes across with excellent balance and detail. 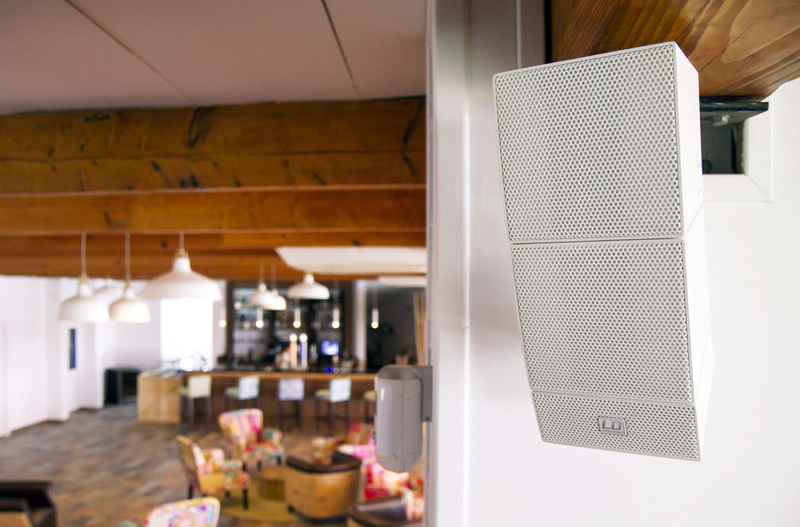 The small bar on the first floor attracts its guests with discreet background music from LD Systems, and CURV 500® systems provide excellent sound in the multi-purpose hall for weddings, meetings or other events. Here, the performance requirements for the PA system are certainly greater, so three subwoofers are used for a powerful bass response. Guests on the spacious open-air terrace, which is directly accessible from the street, are regaled with consistent sound from two white MAUI® 11 MIX systems. The speakers are set up afresh each day, and are ready to use in less than five minutes. 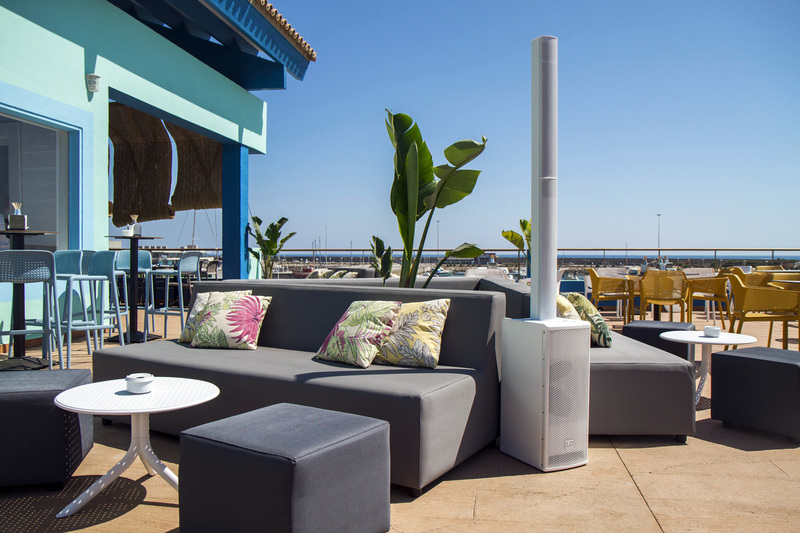 The active PA column speakers provide 120⁰ horizontal coverage, which supplies a balanced sound on the terrace. Thanks to their streamlined appearance and low space requirement (due to their compact footprint), the column speakers blend perfectly into their surroundings. Because of their white housing, the Mauis do not unduly overheat, even in strong sunlight, and look magnificent on the terrace. Two 6.5-inch drivers in the bass-reflex subwoofers provide plenty of punch, and with each featuring eight 3-inch speakers and a 1-inch horn, the vertical array systems excel at clear reproduction, even that of electronic music. With 300 watts RMS per system, the terrace can also act as a stage for smaller concerts when necessary. To optimise the sound on all floors, El Capitán has installed two LD Systems ZONE 624 4-zone mixers as versatile control centres. The compact, 3U 19-inch rack devices feature six line and two microphone channels, which can be assigned to one stereo and three mono zone outputs. In addition, the ZONE 624 also features inputs for external emergency announcement systems and a remote-controlled mute switch. Speaking of announcements, here, the LD Systems ECO 2×2 HHD Wireless Microphone System comes into its own. This two-channel UHF double wireless system works on preset registration- and licence-free frequency bands. The two dynamic handheld microphones and the double receiver are easy to operate and require no previous experience. Two particular challenges had to be overcome for this audio installation: excellent sound provision in six different areas as well as visual integration into the sophisticated decor of El Capitán. Both were mastered with excellent results, according to the owner. “When we were looking for suitable products for the installation, we were initially very concerned because nothing was to our designer’s taste. Because we know from experience in the restaurant-, event- and nightlife-business how important good sound is for the atmosphere and for our guests, we have placed a special emphasis on high quality sound, in addition to visual integration.” When the Adam Hall team presented the CURV 500® AVS system and the MAUI® 11 MIX, we were immediately impressed by the look and the sound of this PA system. When the sun sets on the Andalusian evening, and the party mood in El Capitán starts to percolate, Cameo® lighting products create the visual background. Here, the 3-in-1 Cameo® Storm’s derby, strobe and grating laser effects, and the similarly equipped Cameo® Thunder Wash 600’s strobe, blinder and wash effects provide several options. The ability to use different effects on each of these devices emphasises the flexibility of these products. The company Los Caños de Meca Gestion SL (Barbate-CADIZ) carried out the installation works expertly.